Scott DesJarlais abortion scandal: GOP congressman has a funny way of showing he's pro-life. 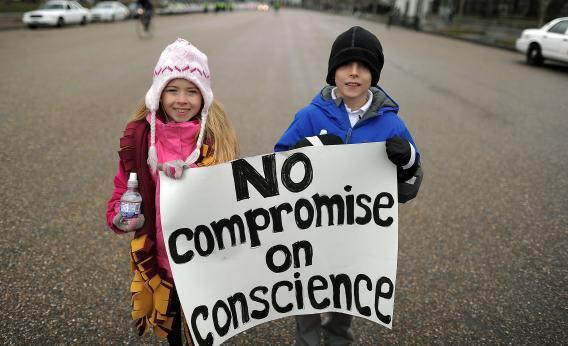 Two children hold a placard as they join other Christian religious activists during a pro-life demonstration in front of the White House in Washington on February 16, 2012. It doesn’t quite seem right to call Republican Rep. Scott DesJarlais a hypocrite. Yes, the anti-abortion congressman pressured one of his multitudes of mistresses to have an abortion and, as has now been reported, supported his then-wife in having two more, and then turned around and ran for office while portraying himself as a “pro-life” family man. But the “pro-life family man” motif has always been just a genteel cover for base sexism, a way of putting a positive spin on the belief that women are a second class of human, put on earth to serve men—making DesJarlais simply an enthusiastic advocate of his own worldview. Let’s not call him hypocritical—let’s call him predictable. This entire situation should serve as an important reminder that people who say they want to ban abortion often aren’t working to make it actually go away. That should be obvious from the fact that they’ve been told, over and over again, that banning abortion simply drives it onto a black market. (In fact, severe restrictions on abortion are strongly correlated with higher abortion rates.) And from the fact that so many who say they want fewer abortions also want to decrease your access to contraception (i.e. the thing that stops the babies from coming). Banning abortion doesn’t make it go away, but it does mean that safe abortion becomes a luxury for the privileged, the kind of people who can afford to pay a premium for it and have the connections to find a discreet provider. Someone like a doctor or a Republican congressman—someone like Scott DesJarlais—will always be able to find a way to get abortions for wives, mistresses, and daughters. Which certainly suggests why a man like him, who has benefited so frequently from abortion, doesn’t hesitate to advocate for bans of it. His access isn’t threatened. Yours is.